PROTECT YOUR DESK Made of durable PU leather material, which protects your desk from scratches, stains, spills, heat and scuffs. It also gives your office a modern and professional atmosphere when you put it on your desktop. Its smooth surface will make you enjoy writing, typing and browsing. It is perfect for both office and home. 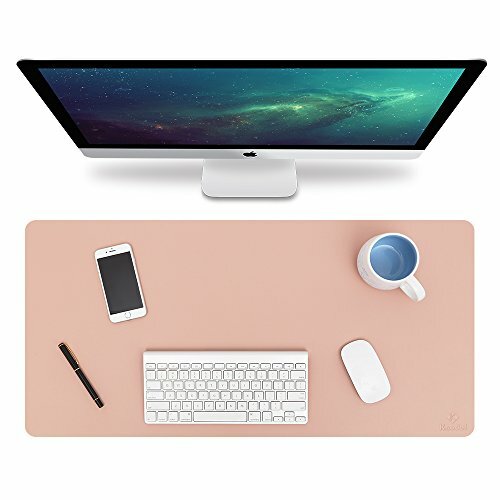 TOUGH DURABLE MATERIAL & DOUBLE-SIDED USE Made of premium PU leather material with durable construction, the Knodel desk pad protector will last for a long time. We designed it with the same material but with different colors on each side, and you can use both sides. MULTIFUNCTIONAL DESK PAD Size 31.5"x15.7", which is large enough to accommodate your laptop, mouse and keyboard. Its comfortable and smooth surface can be a mouse pad and a writing pad. Its non-slip material also adds stability during everyday use. WATERPROOF & EASY TO CLEAN Water resistant and heat resistant material makes this product durable and easy to clean. If you want to clean it, simply wipe its surface with a wet cloth. ONE YEAR WARRANTY We are dedicated to providing our customers with high quality products and superior service. All of our Knodel desk pads come with a one year warranty. If you are dissatisfied with our product, we can offer you a new one or 100% money back. So, what are you waiting for? Get one risk-free by adding this item to your cart NOW! If you have any questions about this product by Knodel, contact us by completing and submitting the form below. If you are looking for a specif part number, please include it with your message.